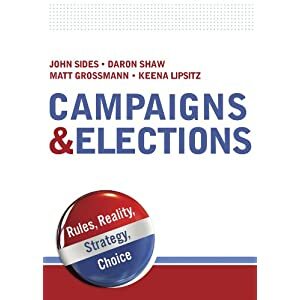 The following is a guest post from Akis Georgakellos, a Political Analyst/Strategy consultant and a directing partner at Stratego, a Greek strategy and communication company, and Harris Mylonas, an Assistant Professor of Political Science and International Affairs at George Washington University and the author of The Politics of Nation-Building (Cambridge University Press, 2012). People across the world know about the great financial crisis that has shaken up the US, the EU as a whole, and Greece in particular. They can also imagine that it was followed by a deep social crisis. A year has passed since the June elections and despite a growing sense of stabilization (political and economic) the situation remains grave for most citizens. Beneath all these realities there are crucial political developments in Greece and one thing is certain, the landscape is currently filled with sand dunes. The political system has never been more volatile in the past 39 years, following Greece’s transition to democracy. Established political parties have shattered into pieces, former dominant cleavages have become obsolete, and political certainties of the past have been forgotten. Age old sworn enemies are now collaborating, one-party governments – a norm in Greek politics – appear to be a thing of the past, the life of governments rarely approaches the full four year period, and the traditional two-party system is delegitimized. For the first time – at least since 1958 – a party on the left is a serious contenter for first place in the next election, one of the most extreme right wing parties in Europe is rapidly accumulating power, new political parties are being formed, and the electorate appears to be constantly changing its mind – at least based on the electoral results and opinion polling. These developments deserve a closer look. The memorandum/anti-memorandum cleavage is still the dominant cleavage in Greek society. In other words, the country’s political forces are roughly divided between those that support the reforms and measures described in the loan agreements signed between Greece, the IMF and the European Central Bank/EU and those that oppose these reforms and measures and even want to declare Greece’s debt illegitimate. The current coalition government includes the pro-Memorandum political forces (ND, PASOK and DIMAR); while the other four parties in the parliament oppose it (SYRIZA- Coalition of the Radical Left, Independent Hellenes, Golden Dawn and KKE-Communist Party of Greece). Interestingly, the two main poles of the current political system (center right ND and left-wing SYRIZA) have not had consistent positions with respect to this question. Prime Minister Samaras (then head of the main opposition party, ND) initially opposed the first memorandum (in 2010), but has become the leading voice in the pro-memorandum camp. According to polls, Samaras gained and sustained popularity since the November Eurogroup agreement on the Greek debt. Alexis Tsipras, head of the main opposition party (SYRIZA), has been consistently anti-memorandum, but has significantly toned down the radicalism of his party’s program and discourse. In such a volatile and novel context old cleavages and slogans of the past have been marginalized. Even classic analytical tools such as the left-right axis of ideological placement and the related labels may be still used as shortcuts for the non-initiated, but hardly hold any water. In the midst of very difficult realities, the electorate seems motivated by a mix of pragmatism and anger. But one thing is certain: the voters have largely disentangled themselves from—often inherited—partisan IDs. It is not uncommon to meet people that are choosing between a left and a right wing party—something unheard of in the past. Citizens are, however, more likely to be clear on the memorandum/anti-memorandum debate. A related crosscutting cleavage is the one between the voters that see the EU as the only way out of the crisis and those that do not see this as a necessary element of the solution to the crisis. There are politicians and parties that are anti-memorandum but pro-Europe, for instance. This may appear extremely contradictory, but for many voters and party leaders it is not. Time will tell if theirs – Europe: yes; Austerity: no – is a realistic aspiration. Another important political demand is the punishment of the old political establishment for its wrongdoings, which seems to be present across the political spectrum. PASOK (center-left party) and ND, the two main rivals that took turns in government and dominated the political system for four decades, are both members in the same coalition government. There is a precedent from the late 1980s of an unexpected alliance between the center-right and the left; but that government had specific competencies. What brought PASOK and ND together was their agreement that Greece must remain in the European family and thus honor the obligations it signed in the various Memoranda. The result, however, is a counterintuitive coalition government that would correspond to the Conservative party governing with Labour in the UK or the Democrats with the Republicans in the US. And this in a political system that has traditionally had an extremely polarized electorate. The fact that PASOK and ND are today in a coalition government is a sign of the strength of the memorandum/anti-memorandum cleavage. This alliance is also linked to the electoral results for the two parties. 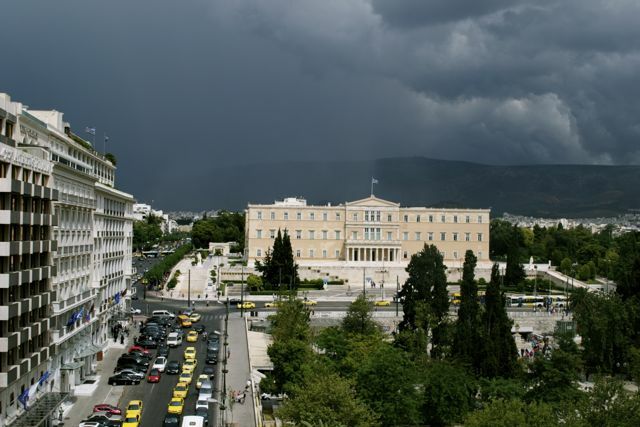 PASOK deteriorated from approximately 44 percent in the 2009 election to a mere 12 percent in the June 2012 elections. In recent opinion polls, PASOK shrunk at 6.4 percent (MRB, June 2013). ND also experienced serious fluctuations in its electoral returns. In 2009, its historical low point was 33.5 percent of the vote share, but although it was in opposition in the May 2012 election, it received only 18.8 percent. ND bounced back to 29.6 percent in the June 2012 election, which followed the May one because no government could be formed from the existing Parliament. In late 2012, ND appeared to be in the second position in opinion polls, but since the early 2013 polls the tables turned and ND has an edge over SYRIZA. In the most recent poll ND is projected at 2.3 percentage points ahead of SYRIZA, with 27.9 percent. We are pleased to continue our series of Election Reports with the following post-election report of last week’s Bulgarian parliamentary elections from political scientists Petia Kostadinova and Maria Popova. For the first time since 2001, no new parties burst onto the political scene. 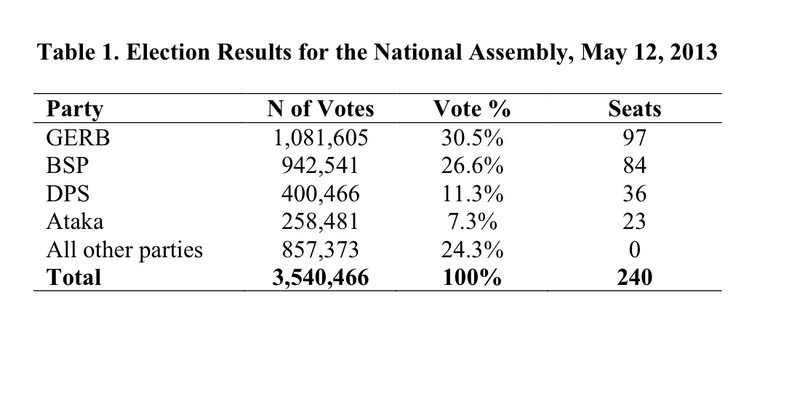 At 51.33%, the turnout for these elections was dismally low by any standards. It was not only the lowest ever in any Bulgarian elections but also the lowest in any democratic legislative elections in the world in recent years. The voter turnout in Slovakia’s 2012 legislative elections (59.11%) was also one of the lowest in Central and Eastern Europe, and only referenda have historically lower turnouts, including one in Bulgaria on January 27, 2013 (20.22%). [ii] Only four parties gathered enough votes to pass the 4% electoral threshold and no party received the majority of the vote. Close to one quarter of the voters (24.3%) cast ballots for parties that did not get any seats in the National Assembly, a significant waste of votes under a proportional representation system. We are pleased to continue our series of Election Reports with the second of two post-election reports on the Malaysian elections by Thomas Pepinsky, who teaches in the Government Department at Cornell University. His first post was presented last week on The Monkey Cage here. You can follow his series of Malaysian election previews at his blog Indolaysia. The following post builds on analyses which were previously posted at the Australian National University’s New Mandala and the University of Nottingham’s CPI blog. In my previous post, I discussed how ethnicity, region, and authoritarianism shape Malay politics. In this post, I dissect the results of Malaysia’s thirteenth general elections (GE13), illustrating these three fundamentals of Malaysian politics at work. The electoral data that I was able to assemble from Malaysian internet sources should be seen as preliminary. Nevertheless, they help us to understand just how the ruling coalition fared. First, two-coalition vote shares by parliamentary district. We see very clearly that East Malaysia’s strong showing for the BN gave the government its majority of seats. This is not new—the 2008 elections also saw the BN depending on East Malaysia for its parliamentary majority—but there will now be unprecedented pressure on the BN to put East Malaysian issues front and center. Also evident in the maps is a clear trend in the peninsula toward opposition victories in smaller electoral districts, which tend to be urban areas. It’s tempting to view this as an urban-rural divide. However, it is just as much an illustration of ethnic politics at work, for Malay districts tend to be large rural districts. To show this, I draw on district level data on ethnicity that I gathered in 2008 (gated version; ungated PDF here). While updated data on ethnicity by electoral district has recently been made available, and I hope to use it in future analyses, these new data will almost certainly not change these conclusions in any appreciable way. First, we can examine the fraction of each district’s population that is bumiputera (in calculating these figures for the peninsula, this means Malay, and in East Malaysia this means non-Chinese) by the district’s total land area. We learn from this figure that there are many small districts with bumiputera majorities, but larger districts are almost exclusively bumiputera. Further evidence of the role of ethnicity can be seen in the following graph. It compares BN vote share in the peninsula to the percent Malay in each district, with each data point colored according to the BN party contesting in that race. 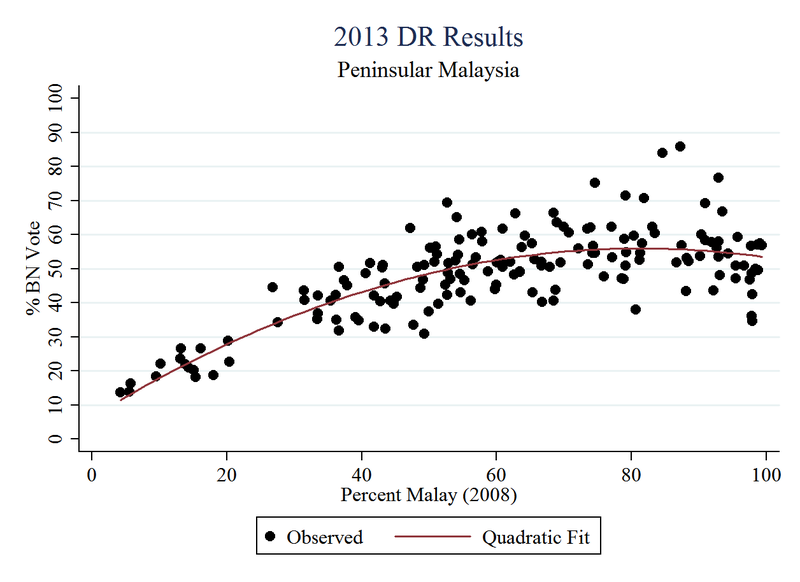 We are pleased to continue our series of Election Reports with the first of two post-election reports on the Malaysian elections by Thomas Pepinsky, who teaches in the Government Department at Cornell University. You can follow his series of Malaysian election previews at his blog Indolaysia. The following post builds on analyses which were previously posted at the Australian National University’s New Mandala and the University of Nottingham’s CPI blog. On May 5, Malaysians went to the polls for the country’s thirteenth general elections, known to Malaysians as GE13. The results are now in, with the incumbent Barisan Nasional government eking out its narrowest ever parliamentary victory of 133 seats to Pakatan Rakyat’s 89. These results are a bitter disappointment to the many Malaysians who viewed these elections as an opportunity to oust the ruling BN from federal office, which the BN and its predecessor known as the Alliance have held in one form or another since 1957. For the BN, the results are surely a welcome relief given the opposition’s vigorous challenge, but they are a weak enough result for this longtime political juggernaut that they will almost certainly necessitate a shake-up at the highest levels. Here, in the first of two posts on GE13, I outline the historical and contextual background needed understand the results, focusing on three basic features of Malaysian politics: ethnicity, regionalism, and authoritarianism. In my next post, I will analyze the results in light of this discussion. Malaysian politics has always centered on ethnicity. The United Malays National Organisation (UMNO) is by far the largest party in the ruling Barisan Nasional (BN, National Front) coalition. Other major parties in the BN include the Malaysian Chinese Association (MCA), the Malaysian Indian Congress (MIC), and a roster of smaller parties which also tend to have ethnic bases, even if they are usually not explicitly ethnic parties in the way that UMNO/MCA/MIC are. The historical alliance of UMNO, MCA, and MIC reflects the basic tripartite categorization of Malaysia’s ethnic landscape into bumiputera, Chinese, and Indian. Bumiputeras (or “sons of the soil”) are mostly ethnic Malays, with the remainder including the indigenous people of the upland regions of the Malay peninsula (orang asli) as well as various indigenous peoples residing in the Malaysian part of Borneo. The ethnic groups today known as Chinese or Indians are themselves also quite diverse communities, with different histories of settlement and regions of origin in southern China and the Indian subcontinent. If this all seems confusing, it is: here is a lecture slide for undergraduate Southeast Asian Politics course at Cornell that tries to organize these cleavages in a systematic way. Importantly, opposition politics also follows an ethnic logic too, but in a rather different way. The three members of Pakatan Rakyat (PR, or People’s Pact), are the Pan-Malaysian Islamic Party (PAS), the Democratic Action Party (DAP), and the People’s Justice Party (PKR). Most Muslims in Malaysia are ethnic Malays, so while the Islamist PAS rejects ethnic or communal politics vociferously, its natural constituency is almost entirely Malay. The DAP’s social democratic platform has historically found most support from Chinese Malaysians, so it too has an ethnically-defined constituency even though it also rejects ethnic politics. PKR, headed by former Deputy Prime Minister Anwar Ibrahim, is the only truly pan-ethnic political party in Malaysia, drawing together reformist Malays, Chinese, Indians, and indigenous peoples of Borneo under a single anti-incumbent, reformist platform. 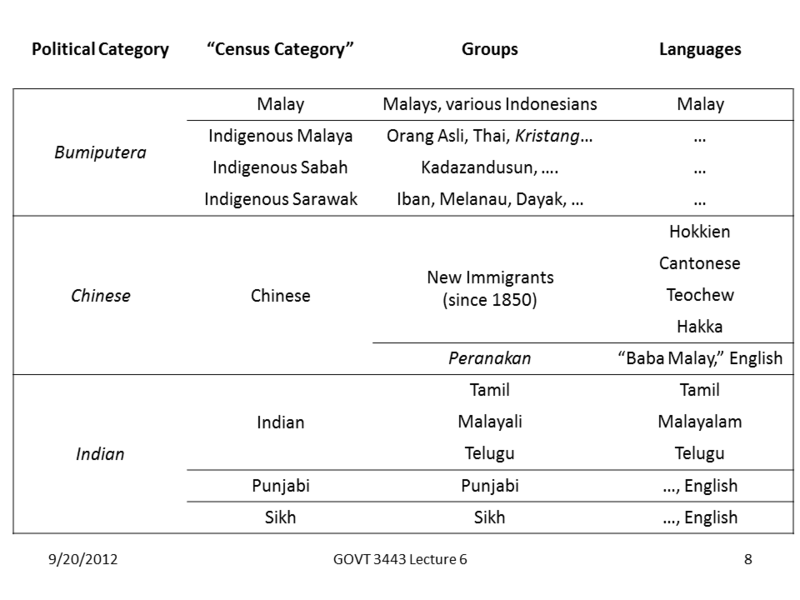 Malaysia’s geography leads to important regional dynamics that interact with ethnicity. Peninsular Malaysia is comprised of eleven states in addition to the federal territories of Kuala Lumpur and Putrajaya. East Malaysia consists of the two much larger but less densely populated states of Sabah and Sarawak, and the federal territory of Labuan, all located on the north coast of the island of Borneo. This regional divide reflects the different ways in which British colonial rule arrived in what is today Malaysia, as the Kingdom of Sarawak (a British protectorate), the British North Borneo Company (Sabah), and a collection of Straits Settlements, Federated Malay States, and Unfederated Malay States in the peninsula. Politics differs in important ways between the peninsula and East Malaysia. For example, the BN’s peninsular members include UMNO, MCA, and MIC; the smaller, multiethnic (but largely Chinese) Gerakan Rakyat Malaysia; and the tiny, multiethnic (but largely Indian) People’s Progressive Party. In East Malaysia, the BN’s members include the LDP, PBB, PBRS, PBS, PRS, SPDP, SUPP, and UPKO, in addition to UMNO (explanations for the abbreviations can be found here). For most of Malaysia’s independent history, the Malay peninsula has been the country’s political center, with East Malaysia relegated to a backwater or afterthought. This is particularly meaningful in light of recent elections, where East Malaysia has gone heavily for the BN. Malaysia’s political system has been called many things: competitive authoritarianism, electoral authoritarian, soft authoritarianism, authoritarian populism, pseudo-democracy, and many others. Malaysia has always had a civilian government that holds regular elections and is bound by the rule of law, with the exception of two years of suspended parliamentary rule following post-election riots in 1969. The issue is that the ruling coalition never loses power, and writes the laws itself. The ruling coalition has many tools at its disposal to protect its tenure. These include UMNO’s impressive patronage apparatus and deep organization and presence in the rural Malay heartland; complete control over conventional media sources; numerous laws that can be used to criminalize political speech, organization, criticism, and collective action and protest; and many others. On the ground observers of GE13 such as Edward Aspinall and Meredith Weiss have indicated that these elections were more or less free, but hardly fair. In every election except for those in 1969, 2008, and now 2013, the ruling coalition gained a two-thirds majority in parliament. In the other three, the BN received only a simple majority. From the ruling coalition’s perspective, the benefit of a two-thirds majority is that it allows the government to amend the constitution at will, which it has done with some frequency. But a two-thirds majority also has an almost mystical quality in Malaysian politics, signifying the leader’s authority alongside the population’s consent. That the BN failed to regain its two-thirds majority in GE13 is viewed by some as an indictment of the current Prime Minister, Najib Tun Razak. In my next post, I will go into some detail about the ways in which GE13 reflects these three fundamental facts about Malaysian politics. 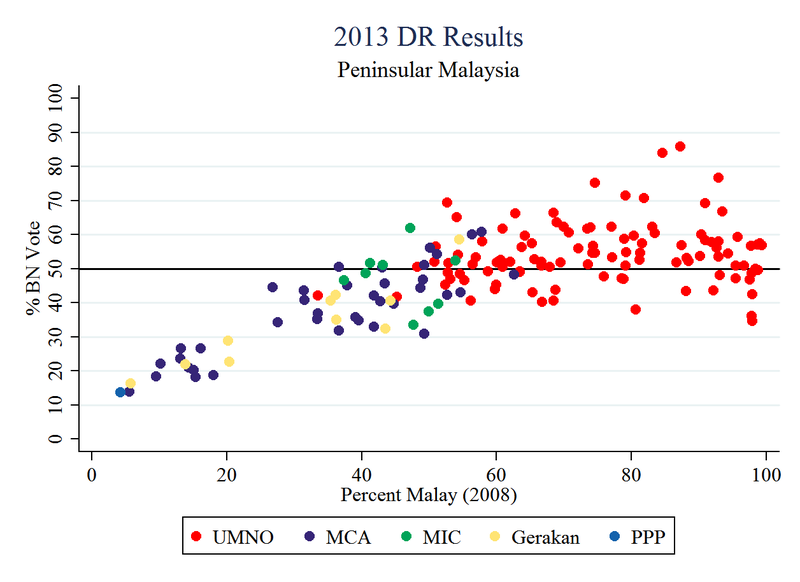 As a preview of that discussion, the following maps show the results of GE13 at the parliamentary district level. Continuing our series of election reports, the following post-election report on the 2013 Venezuelan presidential elections is provided by political scientist Jennifer Cyr of the University of Arizona. Her reports on last year’s Venezuelan presidential election (the final election for the recently deceased Hugo Chavez) can be found here and here. On 14 April 2013, Venezuelans returned to the voting booth for the third time in seven months. They re-elected Hugo Chávez for president in October 2012, and then largely supported his candidates in the regional elections in December. If not for Chávez’s death on 5 March 2013, he would have overseen a largely chavista country for six more years. As it stands, Venezuela decided that Chávez’s chosen heir, Nicolás Maduro, would continue the job that Chávez left behind. Chávez’s self-proclaimed son won the election by a very close margin. According to the National Electoral College’s proclamation, Maduro won the election with 7,505,338 votes (50.66%), while his principle opponent – Henrique Capriles Radonski – obtained 7,270,403 votes (49.07%). This result will surely be too close for comfort for many in the opposition. Maduro himself spent a vast majority of his victory speech asking Venezuelans to accept the results. On the other hand, Maduro retained a solid lead throughout the majority of this short campaign, and the opposition has for months taken great pains to validate the legitimacy of the electronic voting process. So what more can be said of this most recent electoral bout? As I’ve noted here in the past, Capriles has been the opposition’s best chance of defeating the chavistas. His campaign leading up to the October election against Chávez was the most coordinated and unified effort of the opposition to date. In many ways, his April campaign represented a culmination of that effort. Capriles promised, as he had in October, to end the divisiveness in his country; to tackle poverty by maintaining and improving Chávez’s social policies; and to eliminate the exorbitant oil subsidies Chávez had provided to his allies. Always respectful of Chávez in his speeches, Capriles was much less generous with Maduro, who he attacked for exploiting Chávez’s death and ridiculed as someone who could not win on his own merit. Indeed, Maduro campaigned largely and quite openly in the shadow of Chávez. A former bus driver and union leader, Maduro came to be one of Chávez’s closest allies and most loyal followers. Calling himself Chávez’s son, Maduro has organized his campaign around the former leader. His campaign proclaimed, “Chávez para siempre, Maduro presidente” (Chávez forever, Maduro for president). He capped off his campaign speeches with a bird-like whistle, in remembrance of a “little bird” that came to him when he was praying at a chapel near Chávez’s birthplace – a bird that Maduro felt sure was Chávez coming to bless him and his campaign. His frequent references to Chávez, along with the speed with which the new elections were called, suggest that the candidate wanted to capitalize as best he could on Venezuelans’ devotion to Chávez. Indeed, the challenge for Maduro was to maintain the levels of support that Chávez consistently achieved. In all four elections in which he participated, Chávez never received less than 55% of the vote. Rather than cultivate new support, then, Maduro simply had to ensure that Chávez’s loyal base remained loyal to his chosen successor. Maduro therefore had to rally his (i.e. Chávez’s) bases, evoking images of their revered leader and presenting himself as (little more than) Chávez’s chosen son. Capriles, on the other hand, had to convince the undecided voters and at least some Chávez supporters that Maduro was not, in fact, Chávez’s rightful heir. This meant being deferential to Chávez’s legacy while tearing apart – as best he could – the people chosen to carry on that legacy. In the days leading up to the election, Capriles appeared to be closing in on Maduro’s early, rather significant lead. We know now that Maduro maintained the absolute minimum amount of chavista support to eke out a majority win. Of course, Maduro’s most difficult battle begins now. As the constitutionally elected president,* he faces a dysfunctional economy, an incumbent political party on the verge of fracture,** and an opposition that may not take this most recent defeat quietly. For the time being, Chávez’s will has been done, but the extent to which Maduro can follow in Chávez’s footsteps is an open question. Maduro, as Chávez’s Vice President, became Venezuela’s interim president even though the 1999 Constitution mandates that the head of the National Assembly should succeed the president in the event of his/her incapacitation. 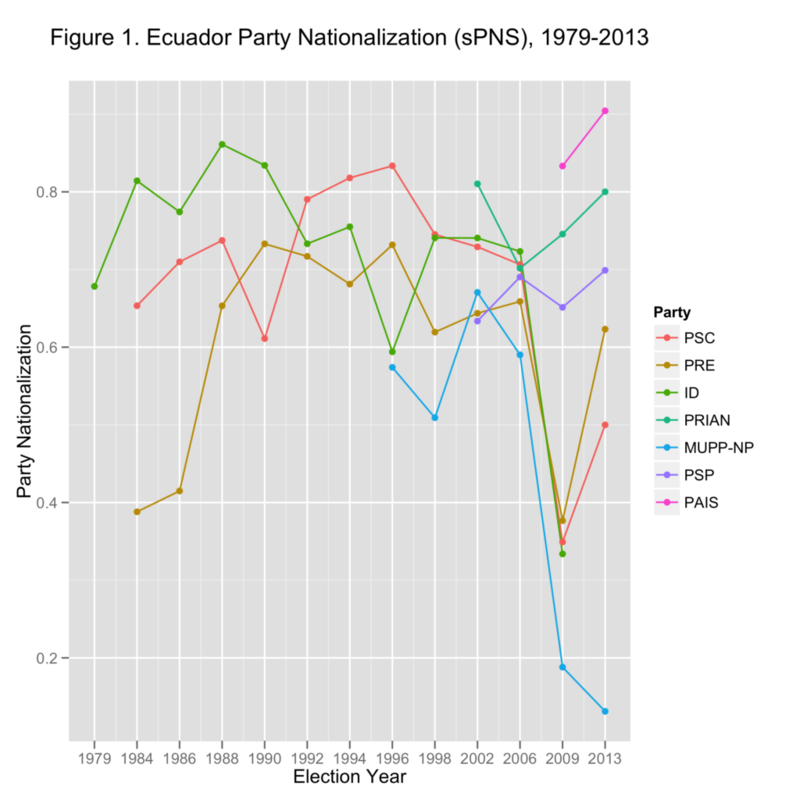 Continuing our series of election reports in conjunction with Electoral Studies, the following is a post-election report on the February 17, 2013, Ecuadorian legislative and presidential elections. The report is written by Jason Eichorst, a PhD candidate at Rice University writing a dissertation that uses automated content analysis of legislative debates to uncover patterns of representation of historically underrepresented groups in Bolivia, Ecuador, and Peru, and John Polga-Hecimovich, a PhD candidate in Comparative Politics at the University of Pittsburgh who is writing his dissertation on the delegation of policy implementation authority in Latin America. This election marks an important milestone for democracy in Ecuador. President Correa is completing the first full term for an Ecuadorian president since Sixto Durán Ballén (1992-1996), and his time in office surpasses that of Isidro Ayora (1926-1931), making him the longest-serving president in the country’s history. His current mandate terminates on 10 August 2013. As expected, Correa easily won re-election in the first-round with 57% of the valid vote, and Alianza PAIS won a 92-seat majority in the 137-member unicameral legislative assembly (seat distribution is still being decided by the National Electoral Council, pending a ruling on potential voter fraud in the province of Guayas). This is Correa’s third presidential election, winning in both 2006 and 2009. His first term was cut short in 2009 for early elections after the adoption of the 2008 Constitution. The 2008 Constitution, drafted by members of Alianza PAIS, allows for immediate one-time re-election. Correa’s 2009 election was the first since the return to democracy in 1979 that a candidate won the presidency without competing in a second-round, exceeding the 50 per cent threshold in the first-round. Legislators are elected separately from one national district (15 total seats), 24 provincial districts (116 total seats), and three “external” districts (6 total seats) using a preferential vote system with seats distributed by party. Candidates run on a party list for each ballot. A voter has as many votes as there are seats. Those votes can be distributed to the entire party-list (en plancha), or redistributed across lists to individual candidates (nominales), as in panachage. A voter does not have to exhaust all of her votes if she decides to select individual candidates. Total party votes combine nominal votes and all of the plancha votes. Seats are distributed from total party votes using D’Hondt formula. The structure of the legislative electoral system encourages a regionalization of the party system, where parties can be successful in specific provinces and non-existent in others (Pachano 2006). Politicians throughout the country’s history have tended to find support in one region or the other, but rarely in both. Notably, since the return to democracy in 1979 business-friendly conservative parties have been successful in the coast and are less competitive in the sierra or Amazonian lowlands (“Oriente”), while labor- and indigenous-friendly parties have found support in the highland Andean plateau (“sierra”). Table 1 shows descriptive statistics for each major party competing in the legislative elections. We show the party ideology (party type), the year the party was established (established), the percent of total votes won (total vote), total number of provinces where the party competed (prov. ), minimum vote percentage (min), maximum vote percentage (max), vote standard deviation (SD), and nationalization (sPNS). The party also benefits by merely showing up. In 2013, Alianza PAIS was one of just three parties (including, the populist PRIAN and PSP) to compete for legislative seats in all 34 electoral districts. Yet it earned significant support in even the weakest of these districts. In total, PAIS won more than 50 percent of the party vote in the coastal provinces (Santo Domingo, Manabí, Los Rios, three of four Guayas districts, El Oro), the metropolitan Quito area (three of four Pichincha districts), and abroad (all three foreign districts, including 69 percent of the vote share in “Europe, Asia and Oceania”). It earned its lowest votes shares in the southern Andes and the Oriente, yet still won 17 percent of the vote in its worst performing province of Loja. The closest competitor to Alianza PAIS comes from the right. CREO emerged as the second-largest political force in the country, with an average of 9% of the national legislative vote and 12 legislators (pending confirmation by the CNE). It ran party lists in 29 electoral districts, and represents a new collection of business and conservative forces to oppose Correa’s “Citizens’ Revolution”. By doing so, CREO also eats away at the PSC’s traditional support. This is very similar to the way Bolivia’s right-wing coalition emerged to combat Evo Morales’ MAS. The party has ties to Guayaquil and Quito’s chambers of industry and commerce. Continuing our series of election reports, we are pleased to welcome the following post-election report from Stanford University political scientist Ken Opalo, who is blogging about the Kenyan elections here. His pre-election report is available here. Our first post-election report (from the day after the election) can be found here. On March 4th Kenyans went to the polls to elect the country’s 4th president, among other officials. Most polling stations opened on time at 6 AM. Some, however, opened late due to late arrival of voting materials or the failure of the biometric voter registration (BVR) kits that were used to identify voters before they cast their ballots. It was the first time that Kenya had implemented an electronic voter register, the previous manual register having had hundreds of thousands, if not millions, of ghost voters. It was also the first election following the enactment of a new constitution in 2010, which doubled the number of elective contests in the general election. With the botched 2007 general election still fresh on everyone’s mind, the Independent Electoral and Boundaries Commission (IEBC) was keen on guarding the credibility of the process. The actual voting went relatively well. Besides a night attack on the eve of the election by a separatist group in the former Coast Province, there were no major incidents. Most polling stations closed at 5 PM and those that opened late were allowed to extend voting until 10 PM. The tallying exercise began on Monday night. Priority was given to the presidential race, with the electoral commission promising final results within 48 hours. But this was not to be. A few hours into the tallying process the dedicated virtual private network (VPN) used to relay the results from the 33,000 polling stations to the national tallying centre in Nairobi crashed. More than 36 hours after polls closed, only 42% of the votes cast had been counted. Two days after the polls closed it emerged that the electronic tallying system had a software bug that kept multiplying the number of rejected ballots by a factor of eight. At one point rejected ballots amounted to 6% of the total votes cast, generating nervousness among election watchers over the credibility and legitimacy of the eventual outcome. A correction of the error saw the number of rejected ballots drop to just under 1% of the total votes cast. Continuing our series of election reports, we are pleased to welcome an immediate post-election report (sent to me from Kenya three hours ago, Tuesday morning) on this weekend’s general election in Kenya from UCLA political scientist Seema Shah. Pre-election reports are available here, here, and here. Kenyan elections have been underway for slightly more than 24 hours, and the much-touted voting technology, or lack thereof, has been at the center of attention. Within hours of the opening of the polling centers, reports from around the country announced the failure of the biometric voter identification system. This technology, which recorded voters’ fingerprints and other biographical data during the voter registration process, was meant to then identify registered voters on Election Day, using Kenyans’ individual biometric identity information. Due to a number of problems, including power outages, low battery life of the devices and polling officials’ difficulty accessing the central system, however, many stations had to resort to using the manual register. The use of the manual register made incredibly long lines even slower to move. Voters had formed queues before dawn in some areas, and some polls, which opened late, saw voters continuing to wait under an increasingly fierce sun. Even where the voting centers opened on time, progress was slow. It was, after all, the first election since the promulgation of the new constitution, which created a devolved system and requires Kenyans to vote for six different public officers. Many polling centers also struggled to organize the thousands of voters in line into shorter “streams,” which grouped voters into alphabetically ordered groups. Lines were so cumbersome that many waited for hours, sometimes on the main roads outside of the polling centers, only to find that their streams inside were relatively empty. If they had been able to enter the correct streams from the beginning of the process, instead of having had to first wait in the longer, main line just to enter the station, they might have moved more efficiently. Still, Kenyans showed true commitment, enduring the wait with patience. One woman even delivered her baby at a polling station, staying to cast her ballot before going on to the hospital. The biometric voter identification problem was compounded on Monday night, when the electronic results transmission system (ERT) experienced what IEBC CEO James Oswago described as a “glitch.” Oswago explained that at one point in the evening, the server experienced an error related to insufficient space to accommodate incoming results. The error was corrected, and results again began streaming in. The electronic results transmission system is, in fact, one of the most critical aspects of this election. In 2007, it was precisely the lack of transparency around results from critical constituencies that sparked widespread unrest. The new electronic system, which allows polling center agents to transmit results to the IEBC via mobile phones, is supposed to be fool-proof. Testing of the system in the days leading up to this election, however, revealed problems. In one test, the system failed in four out of five mock polling centers. Similar deficiencies were seen during the national simulation of the election. Given the context of the last election, in which the lack of transparency around results transmission from certain key constituencies sparked massive unrest and violence, the new, allegedly fool-proof electronic system is especially critical. Both the IEBC and the Kenyan government recognized the importance of a more reliable system early on in the election preparation process. In fact, when the IEBC cancelled its original tender for the biometric voter registration kits, the government stepped into assist with their procurement. In response to the failure of the biometric voter identification system, many polling centers resorted to using the manual register. While this is a good back-up system, complete reliance on it opens up avenues of manipulation, especially since not all polling station officers are required to be from outside the area in which the polling station is located. This increases system vulnerability, especially in party stronghold areas, where there is more likelihood of community pressure bearing down on polling agents to make sure the a particular candidate’s “home turf” shows its support in the way of overwhelming support. So much is about perception, and the use of the manual register can only go so far in assuring the public that there are checks on those who may be inclined to sway things in a particular direction. It is not hard to see that this may also risk decreasing public confidence in the integrity of the system. The IEBC is now worryingly silent. In the two IEBC briefings held since the occurrence of the “glitch” in the results transmission system, little information has been provided. While the error might have been resolved, political parties are already on guard. The Orange Democratic Party (ODM), led by incumbent Prime Minister Raila Odinga, has already expressed its fears, explaining that the server was down for six hours. Questions from the press and public were not taken in either briefing. Were all the results that were unable to be processed during the time the server was down eventually uploaded? Are the results being streamed now reflective of those results? It is worth questioning why, thirteen hours after polls officially closed, the IEBC is only showing results from about 30 percent of all polling stations. It is true, of course, that there were still extremely long lines when polls closed, and centers had to accommodate all those waiting. Still, even with the assumption that some polls only closed at midnight (7 hours after the official end of polling at 5:00pm), it seems reasonable that by 8:00am (8 hours later) more than 30 percent of all stations would have finished counting presidential results. The slow pace of the incoming results combined with the “glitch” in the results transmission system leave room to wonder whether the transmission system is fully functional. Are returning officers now unable to use the ERT? If so, how are they transmitting the provisional results? It is only fair that the IEBC informs Kenyans of what to expect, including possible mishaps and delays. This will lead to an understanding that some mistakes are to be expected and do not spell an irrevocably flawed election. Given the context of the last election, which is fresh in everyone’s minds in the current post-polling environment, clear communication from the IEBC is vital to maintaining public confidence in the system. Continuing our series of election reports in conjunction with Electoral Studies, the following is a post-election report on the February 24-25 Italian parliamentary elections from political scientist Aldo Di Virgilio and Daniela Giannetti of the Department of Political and Social Sciences of the University of Bologna. Pre-election reports on the election can be found here, here, and here. 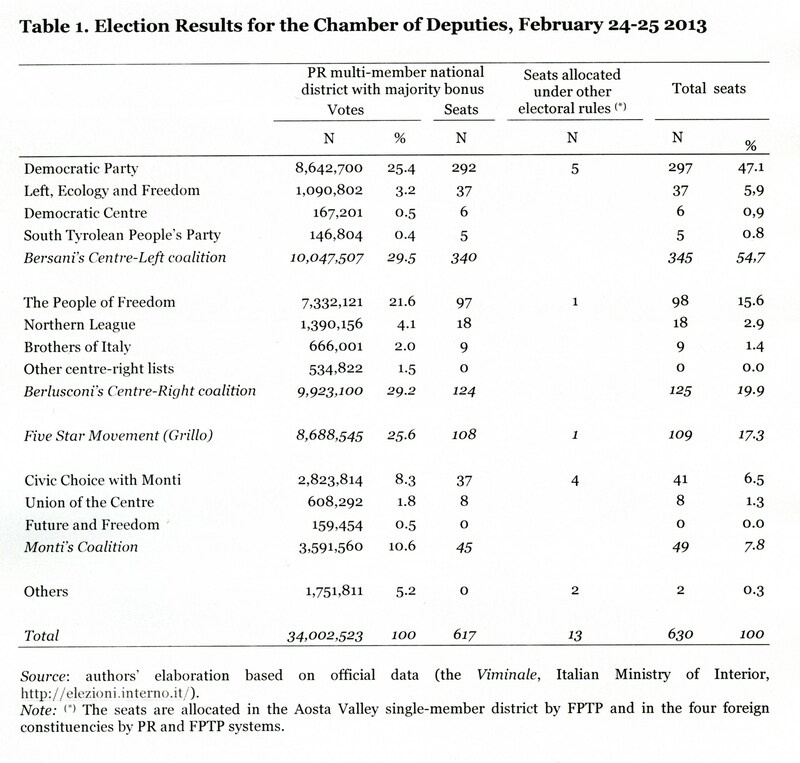 The main results of the Italian General Election held on 24-25 February 2013 were unexpected. The most blatant outcome is the success of the brand new Five Star Movement led by the comedian Beppe Grillo. This political movement received the most votes in the Chamber, gaining more than 25 per cent of valid votes. The centre-left coalition led by the Democratic Party’s leader Pierluigi Bersani gained a plurality of votes in the Chamber (29.5% of valid votes). The seat bonus provided by the electoral system ensured the centre-left coalition a majority of seats (340 seats out of 630). In the Senate, where the seat bonus is allocated on a regional basis, the centre-left coalition gained 121 seats, far short of the majority threshold required to govern (158). The centre-right coalition led by Silvio Berlusconi gained about 29.2% of valid votes in the Chamber and 30.7% in the Senate. The centre-right coalition lost the majority bonus in the Lower Chamber for a tiny amount of votes (124,407) and in the Senate gained slightly less seats than Bersani’s PD led coalition (117). Finally, the coalition led by incumbent Prime Minister Mario Monti barely passed the 10% threshold set by electoral system for electoral coalitions in the Chamber. In the Senate, the Monti led coalition won 22 seats, not enough to be pivotal for any potential centre-left or right wing government. The 2013 elections have resulted in a tie between the centre-left, which was predicted to win in the pre-election polls, and the centre-right. The strong performance of the centre-right was the result of Silvio Berlusconi’s effective personalised election campaign. The coalition led by Mario Monti dropped to fourth place, while the Five Stars Movement is the undisputable winner of this election. Table 1 presents the electoral results in the Chamber (617 multi-member districts, plus the single member district of the Aosta Valley region and the 12 seats allocated to foreign constituencies). No party obtained more than 26 per cent of valid votes. Nine party lists obtained seats. In the 2006 and the 2008 general elections, held under the same electoral system, the two main electoral blocs on the centre-left and on the centre-right gained a vast majority (99% and 85% respectively) of the valid votes. As a result, the seat bonus went to winning coalitions securing more than 45% of the popular vote. The fragmentation of party support in 2013 made it possible for the left-wing coalition to obtain the seat bonus (i.e. 55% of the total seats) with less than 30% of total vote. This high level of disproportionality favouring the marginally most popular coalition highlights the fact that the designers of the current electoral law never expected a third large political group to emerge on the national stage. Grillo’s 5 Star party could form majority in Senate with either Bersani or Berlusconi in Senate, but probably won’t. Should have sold your Euros, Italian stocks, and Italian sovereign debt sometime around 3 PM CET today. You will be hearing a lot about Florence mayor Matteo Renzi in the coming months. For a more thorough and more elegant report, I recommend this post on the blog suffragio. We’ll have our own post-election report(s) later this week.